Dumbo has become a favorite and although the scene with his momma in jail rips me in two; I have to admit that I just love this movie. In the movie Dumbo is born with these huge ears. Every where he goes, he trips over them or they just get in his way of what he wants to do. It because a source of pain for him as he was a slave to these monstrous lobes and those around him that should be supporting him turn their backs or just laugh in his face. He was singled out and turned into a circus freak. Then one day he discovers that those massive ears that held him back and tripped him were not made for merely walking around….he was made to fly! I see a lot of this in myself and the children. We all have our “ears” that cause us to be different than those around us. They trip us up and set us apart. We begin to hate them, to wish for something else and try our best to just fit in. We crave conformity and acceptance. We weren’t made to just fit in….we were made to soar. 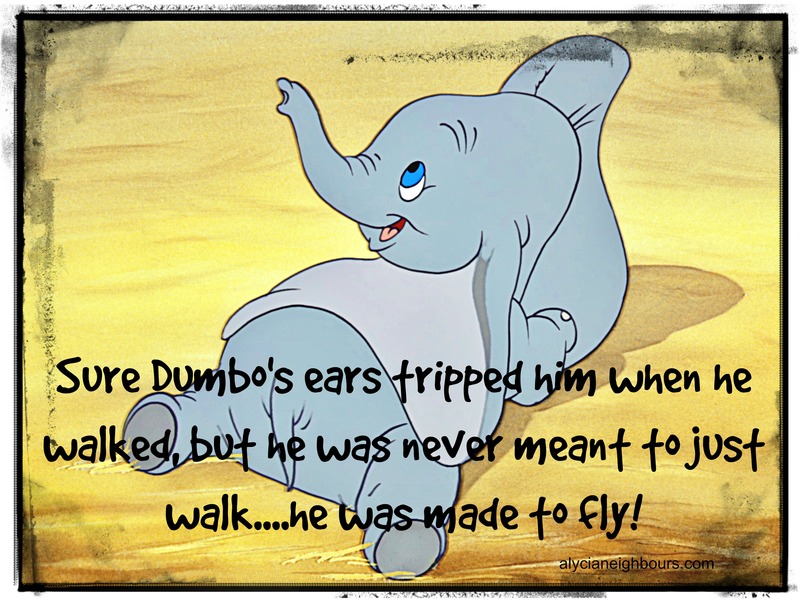 Once Dumbo learns this lesson, he gains freedom. Freedom from lumbering around the ground like everyone else. Freedom from being inside the box of what is “normal.” He becomes his best self. What was once his handicap became his source of joy, freedom and love. As I struggle through parenting several of my children who have “handicaps;” I begin to think about Dumbo and those ridiculously large ears. The inability of them to conform to their peers is blossoming into their biggest asset! The seemingly withdrawn nature matures into intuition and empathy. The struggle to focus on the task at hand is revealing that there is an amazing imagination and creativity. The very thing that I worried might set them back has shown itself as a God gift to set them apart. They were created to soar! As I send them off to school in a week, I will do my best to remind them of those “ears” when they come home disappointed that they are fitting in just perfectly. How can any of us expect to just “fit in” when we were so uniquely and wonderfully created! Psalm 139:14 I praise you, for I am fearfully and wonderfully made. Wonderful are your works; my soul knows it very well.